James Rucker (ColorOfChange) makes the case that Maher should not be re-booking Breitbart, or at the least should come clean about Breitbart's record and not softball him. Cross-posted from JJP. On the night of April 27, 2011, the night of the day President Obama called a special press conference to personally release his birth certificate, thus "showing his papers" to the country, Rachel Maddow was smart enough to turn her show directly over to Goldie Taylor of The Grio. Goldie explains, through a story about her own family, how this aspect of race in America has shown the constancy of the trade winds. Once you have absorbed the video, I recommend to your attention the full text of Goldie Taylor's column at the Grio. ETA: I am reminded by rikyrah at JJP to remind you to check Baratunde's April 27 video as well. I just don't want to lose this item from Intelligent Life magazine (from The Economist) before I've had a chance to reread it. I think you'll find more on topic re: technology and Africa, or corporate dominance and Africa, elsewhere... I focused on this article in the first place due to coverage at CNu's place of Libya's impact across Africa. When it comes to electricity, Africa remains the dark continent. There are a billion Africans, and they use only 4% of the world’s electricity. Most of that is round the edges, in Egypt, the Maghreb and South Africa. The rest of Africa is unlit; seen from space, the Congo River basin is as dark as the Southern Ocean. Demand for power is already outpacing economic growth. With its population expected to double to 2 billion by 2050, Africa will have to build entire new power grids just to stand still. So far, the failure has been systematic: of Nigeria’s 79 power stations, only 17 are working. All of this increases political risk. Some African countries could collapse by 2020 unless they can power an industrial base. Yet Africa’s virtual future is not dependent on its physical future. You don’t need much electricity to run a phone network. You need even less to run a phone itself. Even the scabbiest African village has worked out how to charge mobiles and other devices using car batteries, bicycles and solar panels. Connectivity is a given: it is coming and happening and spreading in Africa whether or not factories get built or young people find jobs. Culture is being formed online as well as on the street: for the foreseeable future, the African voice is going to get louder, while the voice of ageing Europe quietens. Google & minority hiring practices as "trade secret"
Duly noted that Blogger is owned by Google and all that, and people providing "free" services don't have to explain anything, not really. Yeah, I'm glad for the space, having haggled with ISPs in the past. And I can follow that Google's hiring process might be a trade secret. But the actual numbers of minorities employed? Reverse-engineer those numbers to understand Google? The universal search engine may not be as transparent as it claims. Google’s mission statement is to “organize the world’s information and make it universally accessible and useful,” yet when asked to disclose data about its internal hiring process, the company flatly refused. Google has claimed that its hiring procedures are a trade secret, but other Silicon Valley heavy hitters like Intel, Cisco, and eBay have released their data. ETA: Here's a 30-min. NPR segment with Lusane. 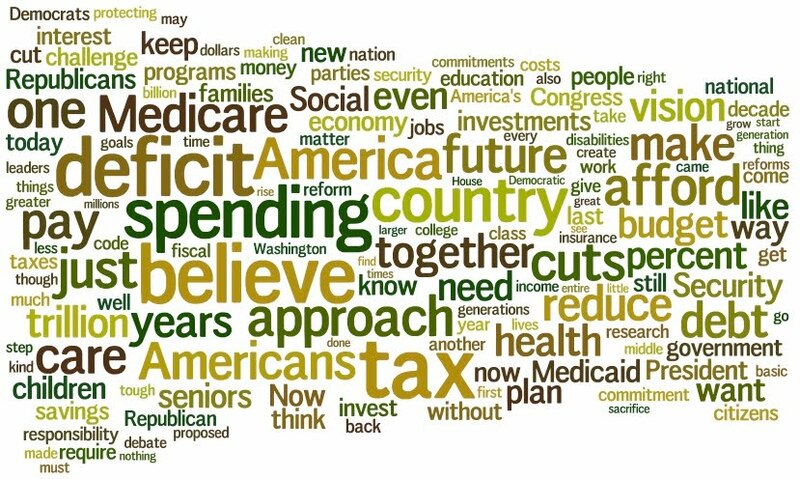 Here's a Wordle visualization of the text of President Obama's speech at GWU on Wednesday, April 13. (The words laughter and applause were removed.) Click on the image for a larger version. Democratic Gov. Jerry Brown signed a bill late Monday that aims to make a key part of his budget proposal a reality -- AB109, which authorizes the transfer of thousands of state prisoners to local jails (and also shifts various other criminal justice functions away from the state and down to the county level). One problem: Brown planned to fund the measure with tax increases and extensions -- you know, the ones vehemently opposed by Republicans. The governor had hoped to put those taxes before voters in June, but threw in the towel last week after being stymied by that GOP opposition. Late Monday, Gov. Jerry Brown signed into law a bill authorizing the return of certain "low-level" nonviolent offenders to California counties — with the caveat that it won't happen until the money is there to help counties accommodate them. The bill approved by Brown says the "realignment" is scheduled to begin July 1 — but can only go into effect "upon creation of a community corrections grant program to assist in implementing this act, and upon an appropriation to fund the grant program." Despite that provision, some local police leaders fear the state won't follow through with adequate funds. "The California Police Chiefs Association has had a lot of trust in Governor Brown since he was attorney general," said Marina Police Chief Eddie Rodriguez. "He normally does what he says. The only problem is the state is in a fiscal crisis and we don't know where that money will come from." "I don't think 'make sure that it's fair' is part of the paradigm," said Sheriff Scott Miller. "It's not going to be a pretty thing." INTERMISSION: Here's a San Francisco Chronicle cartoon that sums up the above two articles, I think. 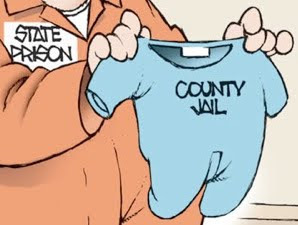 Click the jammies to see the whole Tom Meyer cartoon. Our current way of doing business makes no fiscal sense. We spend about $52,000 to keep each woman behind bars for one year; the two largest women's prisons, both in Chowchilla, cost $278 million to operate annually. Annual costs for social services for children of female inmates are estimated at $56 million. As costs to house state inmates have soared in recent years, many conservatives are reconsidering a tough-on-crime era that has led to stiffer sentences, overcrowded prisons and bloated corrections budgets. California prison guards and their supervisors have racked up 33.2 million hours of vacation, sick and other paid time off - an astounding accumulation that amounts to nearly half a year per worker. It also adds up to a $1 billion liability for taxpayers of the deficit-plagued state. Poor management at California's prisons has for years allowed workers to stock up on generous amounts of paid time off - a benefit that employees must either use or cash out when they retire. 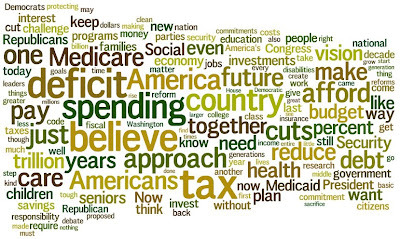 But the numbers swelled when former Gov. Arnold Schwarzenegger imposed furloughs in 2009, forcing prison guards and their supervisors to take unpaid days off each month to help save state cash. Furloughs are problematic at California's 33 state prisons, all of which operate 24 hours a day, seven days a week and have thousands of unfilled prison guard positions. Workers have been coming in on their furlough days and banking paid time off. BlackWeb 2.0 has announced a joint event between Black Weblog Awards and Blogging While Brown, in L.A. over the July 8-10, 2011 weekend. I think I could be OK with people who say "Illegal means illegal" if I didn't know so many so-called upstanding U.S. citizens who regularly broke the law as described in the post title. n Arizona-like law to combat illegal immigration has a snowball's chance in Phoenix of passing the California Legislature, but freshman Assemblyman Tim Donnelly, R-Twin Peaks (San Bernardino County) is giving it a shot. The rally did not go off without a protest, though, as about a dozen people marched and shouted "Si Se Puede" a few hundred feet away. An immigration rights group called the bill "dead on arrival" as it faces its first legislative hearing on Tuesday. BookTV (C-SPAN2) just showed Lawrence Goldstone on Inherently Unequal: The Betrayal of Equal Rights by the Supreme Court, 1865-1903 over the weekend and it's available on demand at their site. May have to multitask and watch it today, even though such practice continues to be decried. The American Prospect Q&A linked below is interesting for where Wilson agrees w/ President Obama (e.g. Promise Neighborhoods) and where he doesn't (e.g. lack of united Democratic Party & administration message against right-wing racism). Wilson's call to bring race back into the political discussion on the left is a change of his 1990s position, which was based on the political situation at the time (Reagan-Bush years). ETA: A version of this item is cross-posted at Prometheus6 where there's a bit of conversation on Wilson. *Obama/Univision Mar. 28 text here. Full video is here.